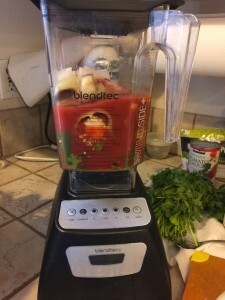 Last Christmas I became the proud owner of the Blendtec Blender with the Wildside jar. I was a little skeptical because I actually wanted a Vitamix. Howver, after seeing it demonstrated at Costco, my husband decided to buy the Blendtec. I was not disappointed! When it was time to take my new blender for a test run, the first thing I tried to make was, one of my favorites, a smoothie. I read the booklet and loaded the ingredients as instructed. The correct way to load a Blendtec is by placing the softer, higher water content ingredients in first, then working up to the hardest ingredient. I usually start with some liquid, then toss in a banana, maybe some fresh grapes and spinach or kale, then, if I don’t have any other fresh fruit, I load in some frozen fruits. The frozen fruits do double duty, by adding great flavor and taking care of the need for ice. You should never overfill the jar. You don’t have to because you can fit a lot in it. Then, I pushed the smoothie button and much to my surprise, I could just walk away! Apparently this is known as “walk away blending.” When the time was up the blender stopped itself and I had a perfectly blended, awesome tasting smoothie! Another great use for the blender is making salsa in one big batch. This is great because with my old blender I had to repeat the process twice to make enough. Again, the process is to load the jar appropriately and push a button. For salsa, I usually stand there and watch it blend. Only takes a few minutes and it’s done perfectly. The construction is great! Here are a few statements from their Website. *It has a patented jar that pulls ingredients toward the blade, which makes cleaning a breeze. I think this blender is a great value for the price. You can do so many different things with it. Drinks, breads, desserts, marinades, dips, soups and more! The best part is that you can go onto the Blendtec website and find tons of recipes! You can find your new Blendtec blender under the kitchen section of my webstore.